CJ was amazing. I had mileage and price limits and CJ found me my perfect car. I bought a new Jeep at St Charles CDJ today and it was a great buying experience. I felt that I was very fortunate to have the pleasure to work with Jake Calistro. Jake is a truly exceptional salesperson. He knows the product line very well, and was very positive and upbeat. He really made the buying experience enjoyable, and helped me find the Jeep that was right for me. Jake was, by far, THE BEST car salesperson that I have ever worked with. He has great communication skills and really knows how to interact in a positive way with a customer. I also have to say that everyone that I encountered at this dealership was friendly and polite. I was really impressed by how well each person did their specific job. Thanks so much St Charles CDJ, I will definitely be back again! If you’re in the market for a new Chrysler, Dodge, Jeep or Ram you need to come into St. Charles Chrysler Dodge Jeep Ram near Elgin today. We stock a large selection of new and used vehicles at great prices. If you need assistance with choosing a new car, obtaining financing, or have service and repair questions, our friendly and knowledgeable staff will get your questions answered. If you’re looking for a vehicle to drive on the streets of St. Charles in style, check out our large inventory of new Chrysler, Dodge and Jeep vehicles featuring the new Chrysler 300, 200, Jeep Grand Cherokee, Cherokee, Wrangler, Dodge Challenger, Dart and RAM 1500 near Elgin. You’ll find that we have a vehicle for every need, from getting around town without having to fill the gas tank, to hauling equipment or kids! The service you’ll get at St. Charles Chrysler Dodge Jeep Ram will be 2nd to none! Call to speak to a friendly salesperson, or stop in and see us. We thank you for visiting our Chrysler, Dodge and Jeep dealership’s website. 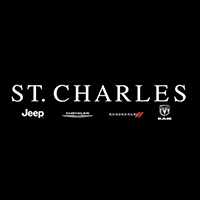 You can find additional information about St. Charles Chrysler Dodge Jeep Ram on our About Us page. We are conveniently located near Elgin, Dupage, Aurora, Naperville, and Schaumburg at 1611 East Main St., St. Charles, IL, and we look forward to serving your automotive needs!